The association and the project of Prostoroz were created in 2004 by three young architects who studied together at the Architecture University of Ljubljana. The Ljubljana they were living in at that time was nothing to do compare to what the city is nowadays. The municipality action plan Ljubljana 2020 and the renovation of the city center started in 2006-2007. Tired, annoyed by their uninspiring and boring urban environments, but full of energy, the young ladies decided to create an association (zavod in Slovene). Their first idea was to create an urban festival every year to talk about and to enlighten some specifics of urban issues in Ljubljana. The revitalization of the city center, which hadn’t started back then yet, was the first topic of the festival. The idea was to create small urban furniture and interventions in the public space to make people aware of the existence of an issue to be addressed. Basic furniture such as benches were added to the public spaces during the festival. Nevertheless, those installations were never taken into account by the municipality in order to build some more long terms ones. Therefore, the three urban activists decided to change the scale of their actions. They started to contact and inform the municipality about some urban issues in order to achieve long terms goals. Tabor Park: This project started in 2010 thanks to a collaboration with the association Bunker and IPOP (an association named Institute for Spatial Policies). Its goal was and still is to revitalize Tabor, Ljubljana’s district adjoining the city center. The activities were implemented in a cooperating with local communities and residents. The first idea was to make a study of the neighborhood to understand the needs of the locals. They discover that this district, former industrial suburb with a strong identity an open public place for meetings of the local community, had completely lost its identity till date. The lack of green spaces, of urban furniture and of activities had created a strong feeling of insecurity and discomfort. Thanks to the creation of a program of events with local associations (theater, sports, gardening, music…) and implementation of small urban renovations, the image of the park slowly started to change. This initiative provides to the locals a place to express themselves without dealing with the technical process of creating an event and to become more known by the wider community. Following its new long term goals, Prostoroz created a contact between the neighborhood and the municipality in order to change the traffic system around the park to make it safer. After 4 years of talks, the municipality agreed to change the traffic system, improving considerably the quality of life around the park. 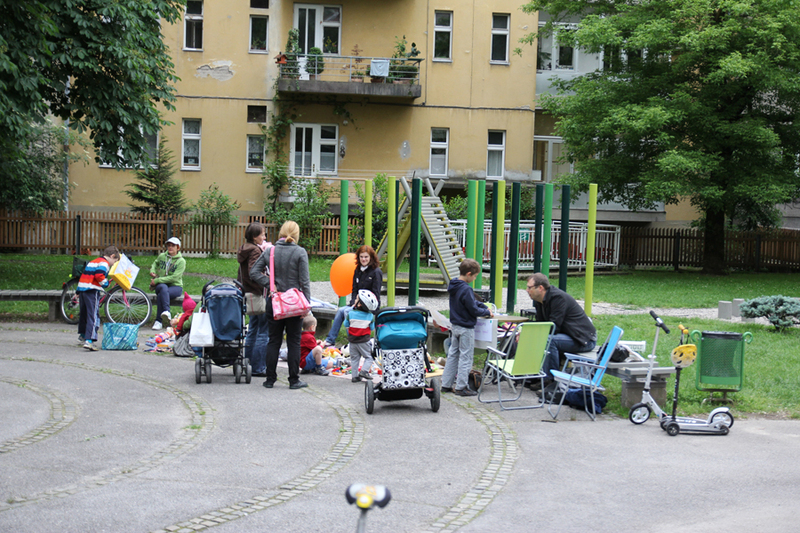 Savsko naselje neighborhood renovation of public spaces: This time, the project’s idea was coming from the municipality. The idea was to involve the locals in the renovation and the management of their neighborhood. The association together with some youngsters who wanted to develop community services in the neighborhood, initiated some workshops and activities about the neighborhood’s renovation. They created a 3D model to understand the important issues to be taken into account. The lack of appropriate parking lots have conducted citizens to park in public spaces, so cars were taking the places of humans in the neighborhood. The workshops were the place and opportunities to think about the future and to create some projects such as a local newspaper, events, a Bloc party with a local rapper, a day center for the youngsters, some urban gardens, a Jane Walk every year to discover the neighborhood. Some projects were implemented and some are still in process of realization today. But the major idea which was to make people become more active was a complete success. Savski hrib: This project was not an idea of the association but one of the mothers who lost her son. He was a basketball player and after his death she decided to give all the money she had gathered for him to the association to renovate the basketball field where her son used to play. To do so, the association decided to collaborate with children aged around 14 years old. In collaboration with the middle school, they had the opportunity to do 5-hours-per-week workshops during several months. Together with the children, they visited the site, searched and studied some best cases/practices in other countries, created 3D models of the area, they drew the plans and did play roles where the children had to imagine how also old or disabled people could use space imagined in their plans. Then they delivered a final project to the municipality who accepted it and the project was built and realized. Today, they continue their activities in this area of Ljubljana by having the intention of renovating a playground close to the basket ball field. This time, the association has collaborated with kindergartens, primary schools and a center for disable people. 4) Knjižnica reči (Library of things): Adapting a concept which already existed in Berlin, Prostoroz created this new type of library where you do not borrow books but objects. The association, with the help of their partner Polygone, started this project in an unoccupied space of a former community building. The project was financed thanks to some funds from the municipality’s fund for social projects. In order to understand what people’s expectations were, the association created a survey. People identified the most important objects that they want to borrow. The objects were donated by inhabitants and in exchange gained a one year free use of the library. In this library, you can find playing equipments, hiking shoes, rollers, tents, tools for gardening or household appliances. For thirty euros per year, people can rent whatever they wish in this library! The project was created by three young architects who studied together at the University of Ljubljana. Maša Cvetko, Ana Grk and Alenka Korenjak, three active women in their thirties are still the leaders of the project. They also own an architecture firm. The architectural sector is in crisis in Slovenia momentarily. Therefore, architects are now involved more and more into bottom up initiatives and participatory actions. They get support by other citizens in their endeavours: by Zala Velkavrh who is the program manager for Tabor Park, by Marko Marovt who gives a technical support, by Nika Van Berkel who is the program manager for Trubar’s Market and Dijana Vukojevic who is the manager for Park Tabor. For every project, the core group cooperates with different associations or citizens. From one project to another, the partners changed and evolved. It can be local associations such as Bunker or IPOP for Tabor Park project, or some institution such as the municipality or public schools or some groups of citizens who want to participate. Everyone is welcome to participate at the activities and everyone can ask for the help of the association to solve an issue in Ljubljana. Design is not the major issue for the association, even though they try to pay attention to the colors, the shapes and the forms used for the construction of new urban furniture and communication tools. For instance when they created some benches thanks to recycle materials, they tried to reshape them and to paint them in nice colors related to the nearby environments. Maša prepared all the communication designs. The association communicate through a website, a Facebook account, a twitter account, some paper prints of their activities, posters, some publications etc.